Roughly 1% of the U.S. adult population are Muslims. The political and social scrutiny focused on this small group has led to major political figures advocating discriminatory practices based on religion alone. In the 2016 Chapman University Survey of American Fears, we explored how Americans as a whole view Muslims. This year, we’ve reexamined many of the same items to see if American opinions had changed. They have. There has been a significant decline in support for increased security measures directed as Muslims. In 2016, a majority of Americans supported increased screening for Muslims at airport and one out of three believed America should cease all immigration from Muslim countries. In 2018, only two out of five agree with extra airport screening and support for an immigration ban has fallen to one out of five. Although one out of three Americans still believes that Muslims are more likely to commit terrorist acts than non-Muslims, this is down substantially from the more than 40 percent who agreed with this statement in 2016. And two-thirds of Americans now report that they would be comfortable with a mosque in their neighborhood. Just over half of Americans felt that way in 2016. In our 2016 data, differences between those who lived in metropolitan areas and those in rural areas were striking. Those differences remain, but fewer people hold negative views in both groups. In fact, in both metro and non-metro areas, those expressing distrust of Muslims are now in the minority. Both males and females express less distrust of Muslims in 2018 than in 2016. The greatest change, however, has been among men. In 2016, males were more likely to express distrust of Muslims than women. In 2018, opinions are roughly either equal or men express less distrust. Republicans, Independents, and Democrats all express less distrust of Muslims now than they did in 2016. 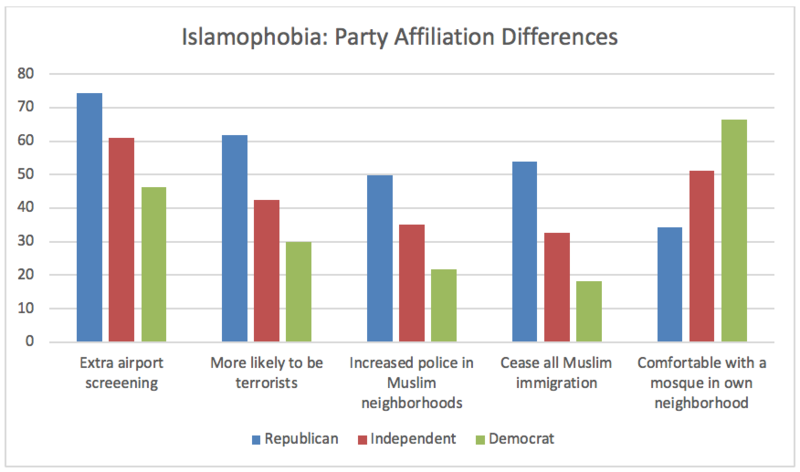 There is still a strong relationship between political party affiliation and anti-Muslim views, however. Republicans expressed the highest levels, Democrats the lowest, and independents remain in the middle. It is worth noting that Republicans are the only group where a majority now expresses distrust of Muslims. Even among Republicans, though, there is no longer majority support for a Muslim immigration ban. Overall, Americans are more accepting of Muslims now than there were in the lead up to the 2016 presidential election. The anti-Muslim rhetoric of some in the president’s administration appears to be generating the opposite effect of what was intended.